The machine is located near the hostess desk in the Patti s restaurant. 1) (H) All lettering stylized to varying degrees. Intertwined with the semi-dotted beaded frame at the top says "Grand Rivers Kentucky" and at the bottom says, in somewhat larger lettering, "1880 s Settlement". 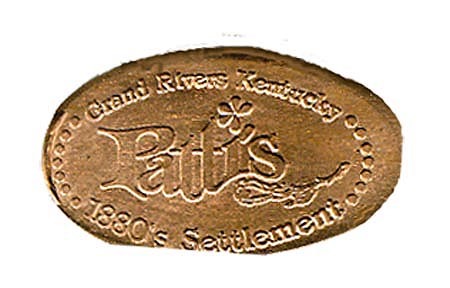 Within the frame is the name "Patti s" as it appears on the logo, except that under the part on the part to the right that curves upwards is the bloom of a cut rose which points to the left.